What would Laura do? Zipper pouch. Laura Ingalls Wilder bag. Little House on the Prairie fans. Gift idea. Calico purse. Whether you grew up on the books our the tv show, you know what a spitfire Pa's little half-pint could be! Show your love for this well-loved classic with this adorable little calico bag. But I can't be responsible for any hot water you might land yourself in if you actually choose to follow through and do what Laura would have done! 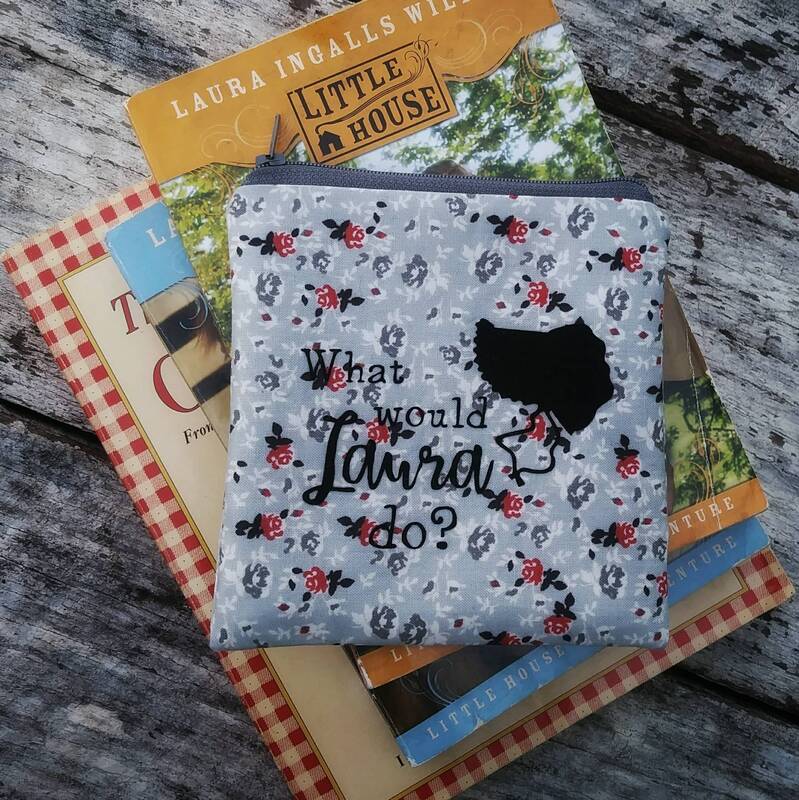 The front of the pouch is decorated with the phrase, What would Laura do?, in a black flocked design. The cotton print on the outside of the pouch is reminiscent of a calico prairie dress and the interior is fully lined with a coordinating red print. The pouches measure approximately five inches square. They are great for tucking into purses and diaper bags to keep small items contained in one easy to find spot. Doily linen pouch. Lined coin purse. Vintage doily on a little square pouch. Floral lining. Gilmore girls pouches. Luke's coffee shop logo. I need Luke's in my life! Gilmore girls zipper purse. Gift set. Daffodil zipper pouches. Springtime flowers purse. Square fabric bag. Small rectangular clutch. Two sizes. Gilmore girls pouches. I speak fluent Gilmore. I'd rather be watching Gilmore girls. Gilmore girls zipper purse. Gift set.